Since 1999, Envy Exteriors has been beautifying outdoor spaces in Magnolia, TX areas with quality landscaping and hardscape services. We are a full service landscaping and hardscaping company. 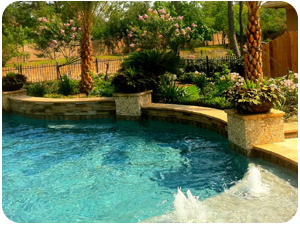 We can handle anything from landscape design to a full backyard renovation with a pool. Creating your outdoor living space means claiming your own little slice of nature and customizing it to suit your lifestyle and enhance your daily routine. Sometimes there is nothing more relaxing than sitting on your favorite patio chair, feeling the warm sun mixed with a cool breeze, and smelling the fragrant flowers blossoming in your garden. Imagine how much more time you would spend outside if you had your very own outdoor kitchen or barbecue, pergola, sunroom, pool cabana, deck or patio to enjoy! Your Envy Exteriors pool is an investment in you, your family and your home. A place where family memories, relaxation, fun, excitement, and entertainment can all be had. Not only will it make your family happy, it will also be a welcome paradise for the next family living in your home, should you ever decide to sell. A pool will not only increase your property value and but add beauty and curb appeal. Neighborhoods we serve are mostly in the country. Let us transform your acreage into your dream property.